Kotak Mahindra Bank offers different many different kind of debit cards to their customers. You can apply kotak debit cards online through net banking. The main advantage of kotak debit card is they support all types online international transaction. If you really want perfect International debit card then you should consider on Kotak Bank debit cards. 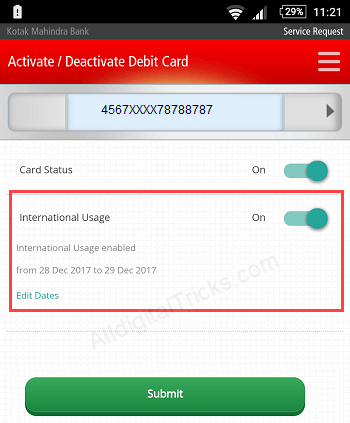 Here we will tell you how to enable International transaction usage for Kotak debit card to use on International websites. You can easily enable or disable International usage for kotak mahindra debit card through mobile banking, net banking and sms. 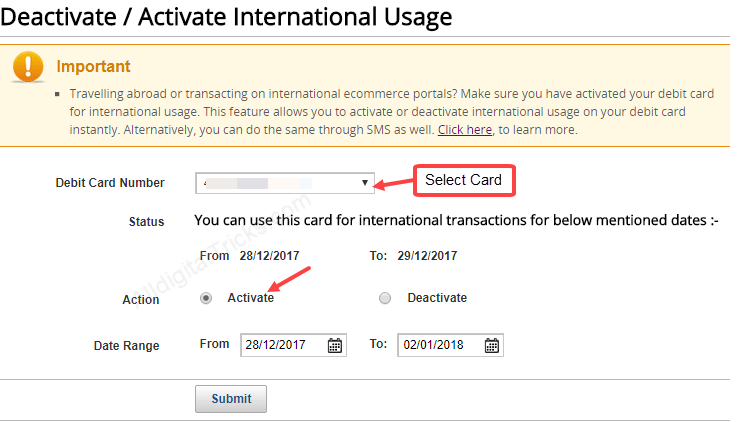 Whenever you want to use your card at any international website just turn usage on or simply disable it. Kotak mobile banking application is available for Android, iOS and Windows Phone. You can access and manage your account online on smartphone. 1: Login to Kotak Mobile Banking. 2: After logging in, tap on Service Request — Debit Card Requests. 3: On the next screen tap on Activate / Deactivate Debit Card. 4: In next screen, turn on International usage and submit your request. You can also set date time limit. After complete time limit international usage automatically turn off. After submitting the request, within 5 minutes your card will be ready to use. You will receive success message on registered mobile number. You can also activate International use through kotak net banking. 1: Login in to Kotak Internet banking first. 2: After logging in, click on Debit card tab. In Debit card you can see your card active card. Simple click on Set International Usage (click here). 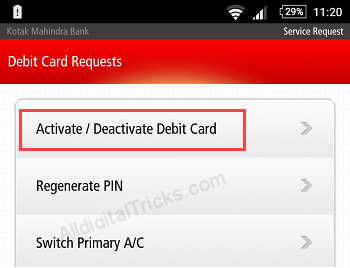 3: In next screen select your card and select Activate option and submit your request. Soon your card will be enabled to international usage. If you have not mobile banking & net banking facility then not to worry. You can still set international use for your kotak debit card. 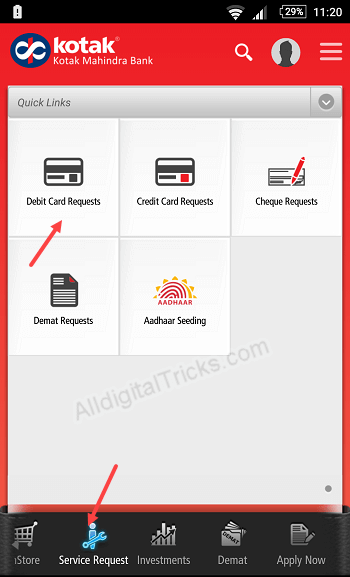 So by following these 3 methods you can enable or disable International usage for Kotak Mahindra debit card.